Embassy Suites Outdoor World is located in the heart of the Dallas Fort Worth metropolitan area just 1.5 miles north of the Dallas Fort Worth International Airport. Guests will be treated to sophisticated service in any of our 329 two room suites. With 20,000 square feet of meeting space, groups will experience the AAA 4-diamond hallmark service for which we are known. Nearby historic Grapevine features six wine tasting rooms and antique shopping on Main Street. Connected to the hotel is the world renowned Bass Pro Shop. It's a wonderful and convenient side trip for the outdoor sports enthusiast. Grapevine Mills Mall offers over 200 specialty stores, restaurants and entertainment venues. Tucked between the cities of Dallas and Fort Worth, Grapevine is central to museums, sporting events and landmark venues for leisure guests and large groups. 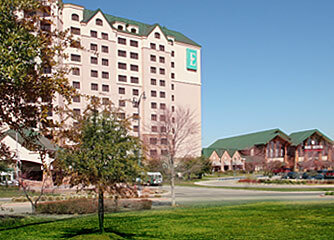 Embassy Suites Outdoor World is a member of Hilton Honors program.